All inclusive suites ranging from 100 - 238 ft2, furnished or unfurnished. Put forth the image your business needs while still working from home. Convenient, professional location without the hassle, burden and expense of a long term lease. All utilities and maintenance included in one simple price. 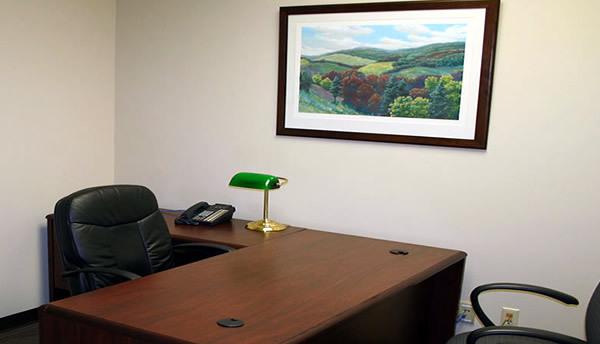 Furnished or unfurnished, all offices are wired for high speed internet and phone service. Conference and meeting rooms available, giving you added flexibility. When you rent office space from Sunset Office Suites, it may sound as if you're renting from some faceless corporation, but you're essentially renting from two regular, hard-working guys named Ronn and Ray. They're accessible, friendly and reliable, and in the office everyday ready to work, and, if need be, provide a helping hand. After working out of my home for several years, the move to Sunset Office Suites has provided me with all the amenities of a large office at the cost of a small one. A personable receptionist, bright meeting and conference rooms, high speed internet, and the full size color printer/copier are just a few of the services that make this the best office space in St Louis. Thanks for all that you do.